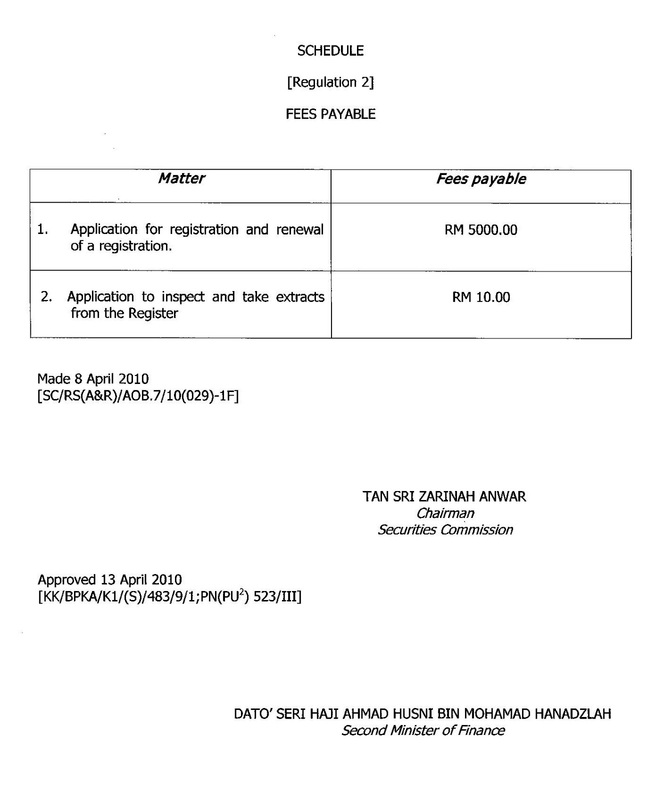 zarinahtakesapaycut: Audit Oversight Board (AOB) Malaysia scandal, who's responsible? Quis custodiet ipsos custodes? Who will guard the guardians? Nik Mohd Hasyudeen Yusoff, Executive Chairman of the Audit Oversight Board, who prior to joining the AOB was also vice-president of the Asean Federation of Accountants and member of CPA Australia’s Public Practice Advisory Committee, former president of the Malaysian Institute of Accountants (MIA) and had served on the Malaysian Accounting Standards Board. Datuk Ali Abdul Kadir, Chairman of the Financial Reporting Foundation. Dato' Azmi Ariffin, Chief Executive Officer of the Companies Commission Malaysia. Goh Ching Yin, Executive Director of the Securities Commission Malaysia. Nor Shamsiah Mohd Yunus, Deputy Governor of the Central Bank of Malaysia. Cheong Kee Fong, Advocate and Solicitor of Cheong Kee Fong & Co.
Chok Kwee Bee, Managing Director of Teak Capital Sdn Bhd. We now ask you a series of questions with regards to what transpired under your watch on the 1st of April 2010. 1. 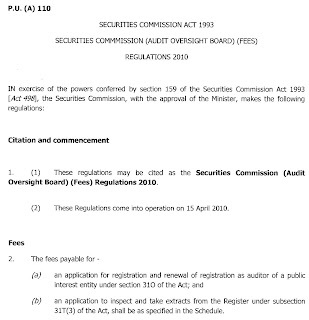 How was the firm of PricewaterhouseCoopers (PwC) and Mr Cho Choo Meng of that same firm, registered by the AOB on the 1st of April, under Section 31s (1) SCA,when the board members themselves were only appointed on that very same day? 2. Who signed the Letter of Registration for the firm of PwC and Mr Cho Choo Meng on the 1st of April? 3. Was it the newly appointed board members? 4. Was it Tan Sri Zarinah Anwar, Chairman of the SC? 5. Or was it Mr Manohar Benjamin Johnson, Director of the AOB? 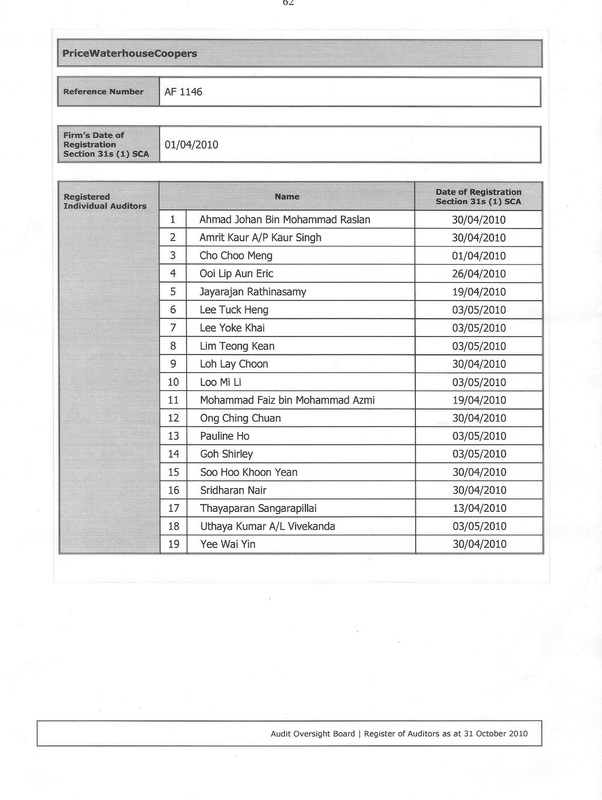 6. Who received the fees necessary for the registration of PwC and Mr Cho Choo Meng? 7.How did this staff member receive the monies on the 1st of April when the legislation to collect the fees was not in place until much later on the 15th of April 2010? 8. 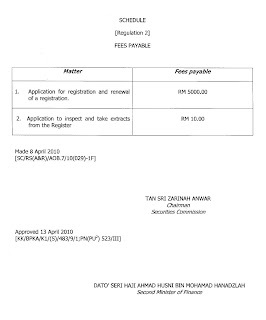 What mechanism was there to receive and process any applications when the Chairman herself, Tan Sri Zarinah only signed the amendment on the 8th of April, and the 2nd Minister of Finance on the 13th of April? that they were Section 8 CA 1965 approved company auditors? not undischarged bankrupts within or outside Malaysia? not convicted within or outside Malaysia of any offence involving fraud or dishonesty? not engaged in any practices which would reflect discredit on its/his ability to meet professional auditing standards? that there were no enforcement actions, sanctions, or disciplinary actions taken by any regulatory authority within or outside Malaysia? and do all the necessary background checks with all relevant regulatory authorities? 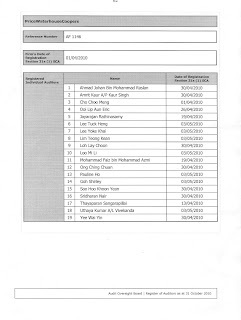 10. Who were the staff or board members who were able to complete such a long list of checks before the end of day so that the Registration letter could be released? 11. Were the forms even submitted when the registration was done, as this seens a physical impossiblity? 12. Who employed Mr Manohar Benjamin Johnson as Director of the AOB? 13. Why did the board allow the employment of Mr Manohar Benjamin Johnson, who was an Executive Director with PwC, the largest audit firm in the country, as the Director of the AOB, which is as clear cut case of conflict of interest as there can be, especially in the light of the fact that the very same firm was also registered very questionably on the same day you were appointed as board members? 14. How can the 7 board members reasonably expect an ex Director of PwC to do a proper check on his former employers? 15. If you were not aware that Mr Manohar Benjamin Johnson was a former employee of PwC at the time, did you formally launch an investigation into his appointment once you became aware of the fact, to ensure that there is no conflict of interest? 16. When will Corporate Governance and transparency in Malaysia be on par with the rest of the world when even regulators like the AOB and the SC turn a blind eye towards questionable acts? Silence is not golden, the Malaysian people deserve and demand an answer to all the questions raised above from the seven of you. Quis custodiet ipsos custodes, when this question was answered by Plato in his work The Republic, he answered that they will guard themselves against themselves. "We must tell the guardians a "noble lie". The noble lie will assure them that they are better than those they serve and it is therefore their responsibility to guard and protect those lesser than themselves. We will instill in them a distaste for power or privilege; they will rule because they believe it right, not because they desire it." I put it to you that there is no noble lie in this case, that there are questions you must answer as guardians of corporate governance in this country, that you must feel in you the same distaste for abuse of power and conflict of interest, that you will do what is right, that you will be true to your calling as one of the guardians for the institutions of this great country. we want an answer too. silent means you agreed with the accused? Just came across your blog. Your questions are valid ones but your blog has no visibility (i.e. not widely read) so how sure are you that PwC etc personnel have even taken note of your queries? Maybe that accounts for the 'silence'? Your blog have some very important question about auditing.But Your site is not very much well known. 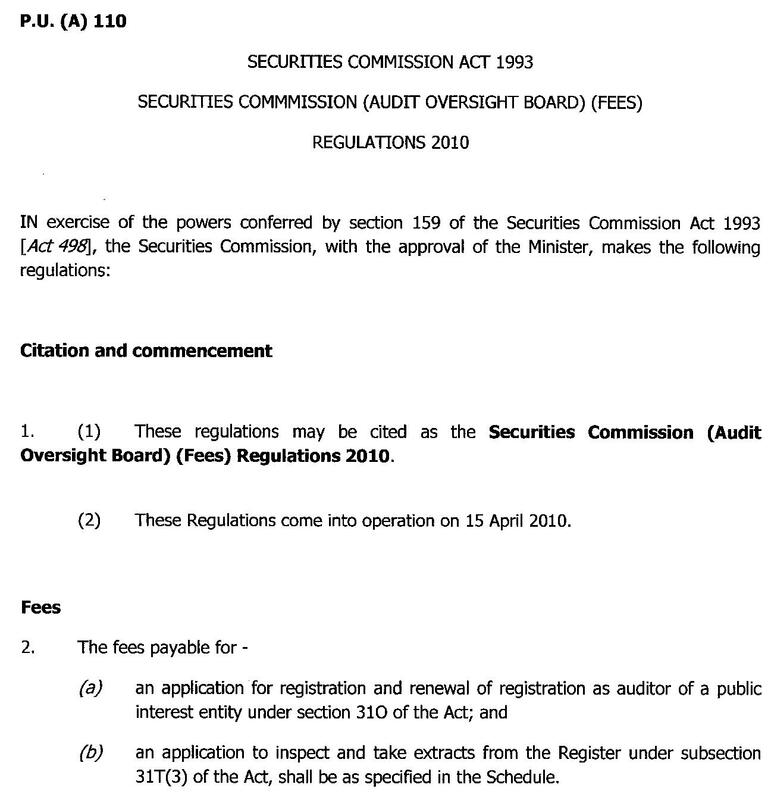 How was the firm of PricewaterhouseCoopers (PwC) and Mr Cho Choo Meng of that same firm, registered by the AOB on the 1st of April, under Section 31s (1) SCA,when the board members themselves were only appointed on that very same day?